Stay had it's first airplay on Radio 2 this morning you can listen again on http://www.bbc.co.uk/programmes/b00n2vjm The song comes on at approx 43 minutes into the show. Don't forget that by dropping the DJ's a quick e-mail to tell them how you like the single might get them to play it more, and hopefully it will then be added to the playlist soon. It only takes 20 seconds! The complet clip is on youtube!!! Wouah it's so...so...!!! And look at his new tatoo!! Yeah his official site added the full video too the other day... Quite nice really Although I don't really get the story behind the clip, if there is one at all. OK he wants her to 'Stay' but -?? Yes his new look is beautifull, it's always a pleasure to watch him :wink: The story and the clip.. Yes you're right..
mm nice...You don't by any chance have a bigger photo or two? Radio 2 C list for the coming week. OK for a start but please consider sending a few requests to some of the DJ's. Most of the links in the radio stations topic should still be valid. 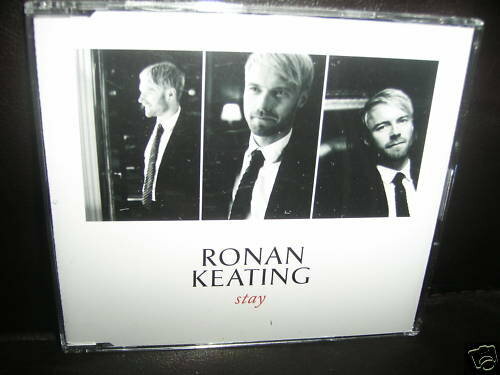 A FORMER Loreto College student is quickly becoming the envy of every girl after getting between the sheets with UK pop artist Ronan Keating in his latest music clip, Stay. Melissa Ambrosini, 23, is back in town after a three-year stint working in France’s popular Moulin Rouge and flitting across Europe working as a model and actress. The striking brunette was aged 17 when she went to Sydney in search of a glamorous career in front of the camera.